NYC, 02/15/2019, 12:30PM. The Blues Brothers (1980): Musical comedy on trying to save a church . 133 min. Director: John Landis. Starring John Belushi, Dan Aykroyd, Cab Calloway. 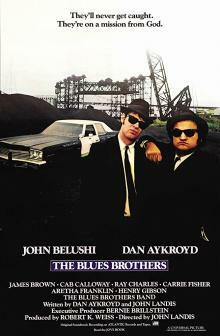 The Blues Brothers is set in and around Chicago, Illinois, where it was filmed. The film in total grossed $57,229,890 domestically and $58,000,000 in foreign box offices for a total of $115,229,890.